Very nearly every day for the last half of my life (21 years, if you’re counting) I’ve eaten the same thing for breakfast. An apple, cut into small pieces, with a few spoonfuls of cereal and some milk. And almost every day for the last 14 years, I’ve given the last three pieces of apple to my dog, Steenbeck. This might not seem like something most dogs would look forward to, but she always came eagerly racing into the kitchen when she heard my spoon hitting the bottom of the bowl. Even when she was very old, and her back legs were rusty, and it was so difficult for her to stand that she wouldn’t bother coming in for her dog food, she’d make her way into the kitchen for her three pieces of apple. She died last Monday, lying in the unseasonably warm sunshine, under a flowering quince bush, in her own back yard. I don’t think she was in pain. She’d had a rough weekend, and could barely stand. She’d been infirm for a year – shockingly thin, (though she ate as much as ever!) wobbly on her legs, prone to seizures. But she’d still been bright and sweet and hungry. I miss her so much! I miss her warmth and humor and sweetness. I miss the 9-week-old puppy that entered our house for the first time and immediately took over. Fearlessly exploring every inch. Throwing herself at the couch in frustration that she couldn’t jump up by herself. I miss the old dog, who barely ever left her dog bed on the floor, who sometimes stood miserably by the couch, remembering that she could no longer jump up by herself. When she was barely a year old, we moved to Boston. David was in school full time, and it took me a little while to find a job and to make friends. Steenbeck was as good a friend as you would ever want. David got out of bed at 6 am, and Steenbeck would move up and put her head on his pillow, and lie alongside me. We’d sit on the bench in the park. She sat next to me, and she was so tall, and had such lovely shoulders, that I could just sling my arm around her neck, and she’d lean up against me. A woman once scolded me for letting Steenbeck put her paws on the bench, so she sat on my lap, and leaned up against me, and together we watched everyone in the park. She was with us for one third of our life. And our life changed so much in that time. The life of a dog is so fast and full of grace, and it makes you think, more than you might want to, about time passing. I mourn her, and I selfishly mourn the person I was when we got her. So many memories are hopelessly tangled with memories of Steenbeck. It’s painful but strangely precious to sort through them now. I miss her speed and strength and beauty. She was so full of life it was almost frightening sometimes! I miss her stillness, too. I can’t describe the comfort of lying next to her when I couldn’t sleep, or didn’t feel well, and all of her strength and energy were contained in this beautiful quiet warmth. So here I am, with an aching emptiness where Steenbeck used to be, crying over the last three pieces of apple in my cereal bowl. This made me tear up. My own dog Kaia is starting to reach that age, where she’s got health issues and is starting to go senile, and I have to start thinking about the quality of her life. It makes me so very sad. Claire/Steen: What a tender and sensitive piece, I don’t usually cry when reading your blog but today I did. I could just change the names throughout and it would be totally appropriate for our dog Seamus who died about 6 months ago, he also came to us at a few weeks and lived to be 14, which is very old for a Shepherd; absolutely the best and smartest dog in the world. I know exactly how you are feeling. And on a similar sad note my lifelong closest friend Allan died also last Monday, sadness all around. I’m very sorry to hear about Steenbeck; we’ve been through the same thing often enough with cats and our old greyhound, and I can empathise with pretty well everything you say. Beautiful tribute. So sorry for you and your family. I know Steenbeck was your beloved girl and her passing leaves a hole in your heart, but you gave her a perfect dog’s life and I hope that comforts you. They just don’t live long enough. What a beautiful piece, Claire. Thank you. I am so sorry for your loss. Beautifully written and moving, I feel for you Claire. Thank you for writing this. I buried one of our old boys in the garden a few months ago. Linda rescued him from some homeless guys who weren’t treating him so well. He’d follow her to the toilet in the middle of the night cos he never wanted to leave her side. Then he stopped eating. Never harmed a soul in his life. I cried all the way home from the vet’s carrying his body. He’s under a big stone, and he’ll never be homeless again. Claire, I omitted to say: What a wonderful memorial for your dog. That was a wonderful and moving piece. I am so sorry for your loss. 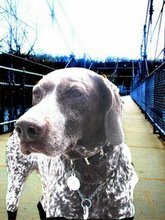 Claire – Wonderful post and a beautiful dog. So sorry to hear the news but it sounds like he always had the right family. Isaac, our last old guy (he was 12), passed away 6 years ago & I still look to step over him when I go for coffee in the morning. It took us two years before we were ready for another dog. But when Murphy (my avatar) showed up it was love at first sight. Seems manifestly unfair they live shorter lives than we do. Maybe that’s why they only have time to love you back. Thank you for the kind words, everybody! There’s a strange sort of comfort in the fact that everybody understands! Nobody has said, “get over it, it’s just a dog,” because I think most people have felt this for a pet, at one time or another. And everybody probably thought, nobody ever loved a dog as much as I loved this one! Claire – sorry to hear of your pain and loss. But what a lovely celebration of a life well lived ! And your love for steenbeck is obvious. Maybe if you threw the last three pieces of apple into your backyard (garden) as a tribute to their rightful consumer, some other, fortunate bird or animal could benefit from your breakfast-time generosity ? ! Chin – that seems like a perfect solution! The yard is so full of life this time of year. Thank you! Powerful and emotional writing, made me cry too. I’m sure you know this but this is the doggy song that celebrates all doggies. What a moving and lovely tribute, Claire. Makes me think of all the dogs and cats we have had. I just read a piece in Malcolm Gladwell’s book “What the Dog Saw” about a dog whisperer who talked about how dogs are so sensitive to human feelings. Steenbeck clearly had that quality in spades, although also clearly had a loving mistress. He did not mention cats, but cats just do not seem to have as much empathy although we were very sad last summer when our cat Zuma of 20 years died. Thanks, Joan. I have a fond memory of being at a dinner party at your house, when I was quite young. I somehow found myself upstairs in the study with Wolfie, and spent some time with him. He was a sweet soul, too! Unvaliebeble how well-written and informative this was. Pffft. We never learn not to emotionally over-invest, do we? A good dog, well-loved. A good life, well-lived.